More and more, parents are buying their own otoscopes for home use. 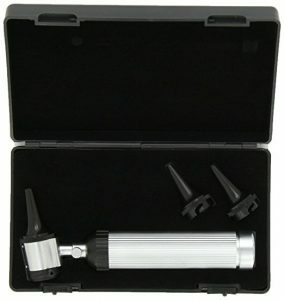 An otoscope is a tool that doctors, and now parents, use to check the health of the inner ear. Otoscopes consist of a light and a low-powered magnifying lens. While only a doctor can actually diagnose infections and other conditions of the inner ear, parents can use home otoscopes to keep an eye on the ear health of their children and catch symptoms of an infection between visits to the pediatrician. Below you will find a review of four different home otoscopes available for purchase. The Dr. Mom Otoscope uses a bright, full spectrum LED light that will never need replacing for the lifetime of the product, and allows for longer battery life. It is equipped with a high quality, scratch resistant glass lens that provides a clear look into the inner ear. It is also paired with a link to 30 high-quality eardrum photos showing different conditions of both healthy and unhealthy ears. Consumers have found this model to be sturdy and easy to control, and it has even been used by doctors who make house calls. 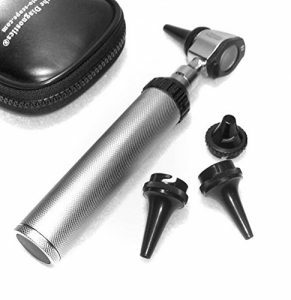 The RA Bock Otoscope is a beautifully designed tool that comes with the ability to adapt to three different types of specula, a scratch resistant glass lens with five times magnification, and uses two standard C batteries to power a bright white LED. The lens is mounted on a hinge which allows for easy cleaning and is compatible with insufflators. The product is backed with a 30-day money back guarantee, and also comes with a handy leatherette case for safe storage. Welch Allyn has been manufacturing medical diagnoses equipment, precision lamps, and patient monitoring systems since 1915, and as a result is one of the most trusted brands in the industry. Their home otoscope, or “Pocketscope,” as they have branded it, is yet another one of their high-quality tools. It uses a halogen light to provide a view of the inner ear that is accurately colored and long-lasting illumination. The head of the otoscope can be detached so the light can be used as a throat illuminator or even an all-purpose penlight. It is also equipped with a sealed system to be used with an insufflator. It is powered by double A batteries, and the light bulb can be replaced as needed. Because of its high quality, it is recommended for use by med students and home physicians. 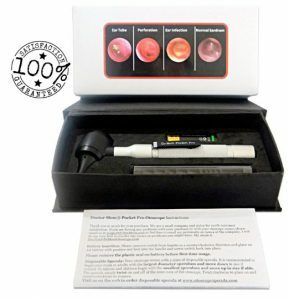 The branding of this product as a “professional diagnostic otoscope” is misleading at best; it is more built for home use by parents to inspect their children’s ears for early signs of infection. It uses a bright white LED, which, while more battery efficient and longer lasting than a halogen light, can lead to a misleading representation of the color of the tissue within the ear. It is, however, built with chrome plated brass, which is much more durable than cheap plastic. It is compatible with three different sizes of specula and comes with a hard case for safe storage. The head is mounted to the handle with a Luer-Lock mount instead of a screw, which is the method of choice in higher quality otoscopes. It is also compatible with an insufflation bulb if you choose to use one. The glass lens, with five-times magnification, offers a clear view and is scratch resistant to ensure clarity for the life of the product. Choosing an Otoscope – How to find the best otoscope for your needs. The health of your child’s ears is the most important thing to keep in mind when purchasing an otoscope. You will want to avoid creating an infection that wasn’t previously present, so it is important to choose an otoscope that is compatible with disposable specula. It is also important to consider which type of light source you would prefer. An LED light will last much longer than a halogen bulb, and uses less power meaning longer battery life, but may not accurately show the color of the tissues of the inner ear. Halogen lights offer a more accurate representation of the color of the tissue but need to be replaced periodically and consume more battery power.